While wireless charging pads have become more commonplace over the past year or so – spurred on by Apple's release of its iPhone 8 and X lines and the company's upcoming AirPower wireless charger – the future of wireless charging may still be up in the air. The ability to charge hardware over distances of several meters has always seemed just around the corner, even when companies first announced the technology years ago. Now, however, some of the companies behind wireless charging have announced partnerships with electronics industry stalwarts, paving the way for actual product shipments. Israel-based Wi-Charge plans to unveil the names of its first vendor partners, who'll be integrating the technology into their products, at the Mobile World Conference Americas Sept. 12-14 in Los Angeles. Once the company begins licensing its technology, which uses infrared beams to transmit power, products should ship soon after – likely early in 2019, according to Yuval Boger, Wi-Charge's chief marketing officer. Last year, Wi-Charge received approval from the Food and Drug Administration for its technology. 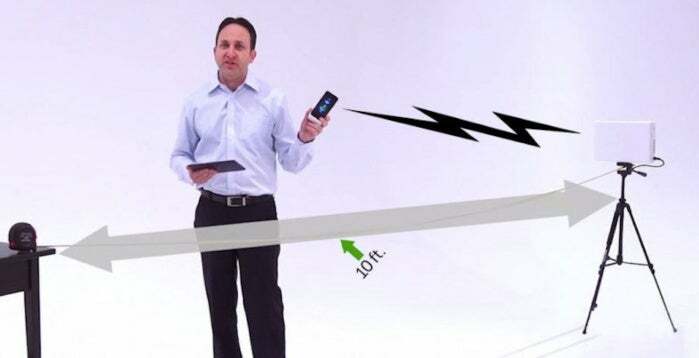 The infrared beams Wi-Charge uses can send power (by line of sight) from a charging hotspot that looks like a Wi-Fi router to devices within a 15-foot range; while the company claims it can transmit beyond 10 meters, acquiring a charging receiver takes longer as the distance increase. "But, once found, the power that can be delivered at 20 meters would be the same power level and safe efficiency as for a target at... 1 meter or even closer," Boger said. The Wi-Charge hotspot can mount on a wall or ceiling and cover an average sized room, so devices can recharge automatically. The company sees its market not only in charging mobile products, but also in IoT devices, such as smart building temperature and HVAC monitors and fire alarms; the advantage is that IoT devices no longer need to be hard wired for power. A single Wi-Charge transmitter can send up to 3 watts of power to devices, such as a smartphone or laptop or less than 1 watt for an IoT device. The company has already developed a small dongle that plugs into an Android smart phone and allows it to wirelessly charge. "We can deliver much more power, enough to charge a phone, at a much greater distance. When we deliver infrared light, we can deliver a really narrow, focused beam," Boger said. "It means if you have a small receiver...you can deliver all the energy coming from that transmitter into that receiver. So, you have very high efficiency and can deliver a lot of energy. "In contrast, when you use radio frequency waves, they diverge. That's really good when you're doing radio transmission because you want all the [radio] stations in your neighborhood to get that, but it's really bad when you do wireless power," Boger continued. "That small receiver will capture a tiny, tiny fraction of the power." The safety limits for RF energy are also lower, Boger argued. "We can deliver several watts of power at 15 feet," he said. The price of a Wi-Charge smartphone dongle could run around $10, Boger said, and while he couldn't say what the retail price for a Wi-Charge hotspot might be, its parts will cost about $100. "Today we have two models, one that focuses more on IoT devices. This could be smart home devices, this could be sensors on smart buildings...or, for instance a smart door lock. This technology can replace batteries and, of course, it can replace power cords," Boger said. He added that wireless speakers could get both music through Bluetooth transmissions and power via the infrared transmitter. The company's other transmitter is aimed more at mobile use, offering several watts of power from up to 15 feet away. Another wireless charging-at-distance firm, Ossia, has partnered with with electronics manufacturer Molex to boost development of its first products, which should be available this year. And, even before it's shipped a single charger, Ossia this month announced improvements to its firmware that increase the amount power devices can get from its transmitter by 50%. Ossia's Cota technology uses radio frequency (RF) to send power and data over distances greater than 15 feet. Cota Transmitters can link to charge dozens of mobile devices within a several-meter radius, and the transmitters come in multiple form factors, including a drop ceiling tile. 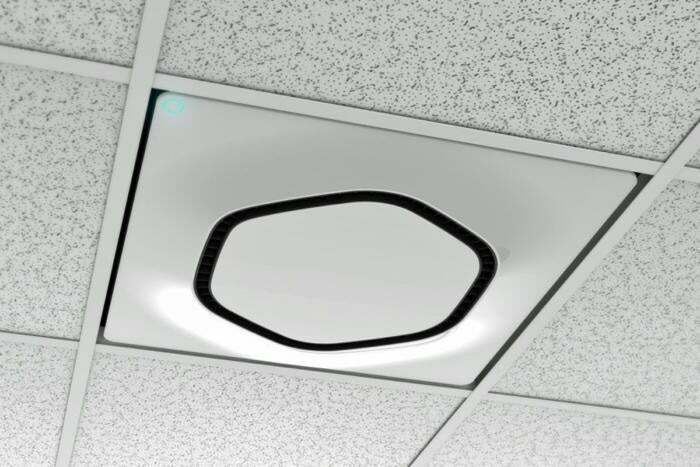 By linking two Cota ceiling tiles, the system can power mobile devices in a typical coffee shop, office or other crowded space, the company claims. It has also developed AA batteries that can receive a wireless charge. 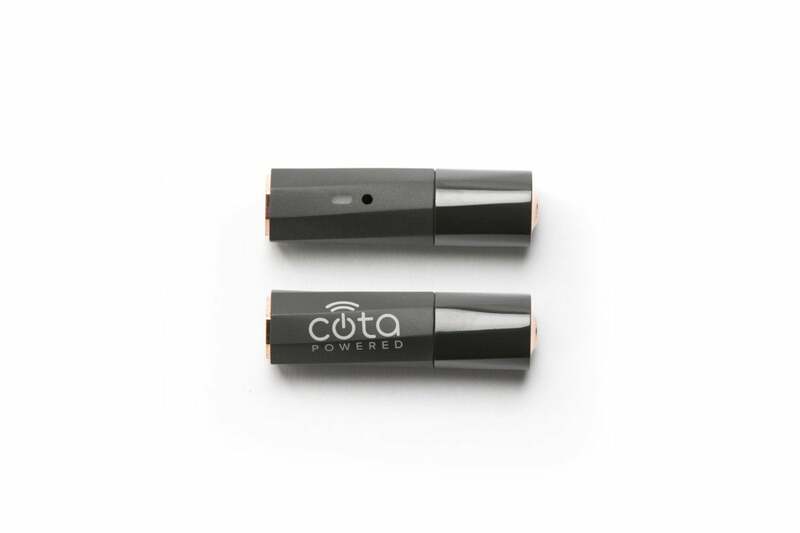 Ossia announced that the Cota Real Wireless Power system will soon be available in the 5.8 GHz ISM band, a higher frequency that will allow for more targeted delivery of power. It did not disclose how much it will be able to transmit, though past iterations have been around half a watt. "Let's say I'm in an office for eight to 10 hours a day and I'm receiving a half a watt or a watt of power; it's charging my device all the time," Ossia CEO Mario Obeidat said in an earlier interview. "So if it takes five hours to fully charge that device, that's fine because you're there all the time." An Ossia competitor, Energous, received FCC approval in December when the agency certified the company's WattUp Near Field transmitter. Like today's popular charging pads, it enables contact-based, fast-charging capabilities for mobile devices such as smartphones and fitness bands. Like Ossia, Energous has partnered with a large electronics manufacturer, Dialog Semiconductor, to help it distribute its technology. "I've used both [Ossia and Energous]; the technology works," Rob Rueckert, the managing director at Sorenson Capital, a private equity and venture capital firm, said in an earlier interview with Computerworld. Rueckert believes charging at distance is a more compelling technology than charging pads or even boxes that still require a mobile device to be relatively tightly connected to a charging source. Ossia, Energous and another charging-at-distance company, uBeam, all demonstrated uncoupled charging technology at CES earlier this year. UBeam uses ultrasound to transmit energy to receivers. Unlike today's most popular wireless chargers, which require devices to rest on a charging pad, Ossia is among several companies developing trickle-charging capability that can send power through walls or simply top off a device when you enter a room. Unlike trickle-charging, Wi-Charge hot spots offer a significant power boost that could fully charge a depleted Android smartphone in about three hours, according to Boger. One potential obstacle to adoption of wireless charging at distance is that neither Ossia's nor Energous' can charge Qi-enabled devices; the technology is proprietary. Wi-Charge, however, has developed a Qi-enabled charging pad that doesn't need to be plugged in; it receives its power via an internal battery that is charged via the wireless hotspot. Essentially, the Wi-Charge hotspot is charging the wireless charger, which in turn, charges the smartphone or other Qi-enabled devices. "The [energy] receiver has a photovoltaic cell. It's like a little solar cell. The transmitter searches in the room for devices it can power and once it finds that device, it sends a really thin, very focused beam of invisible, infrared light and delivers that power," Boger said. While a device being charged through the infrared beam can be moved and still receive power, once something cuts off the infrared beam, charging stops until the line of sight is restored. Apple, too, has dipped its toes into the arena of more loosely-coupled wireless charging technology. A month after announcing the AirPower charger, Apple purchased New Zealand-based PowerByProxi, whose wireless charging technology can send power to multiple devices, from headphones to remote controls. PowerByProxy makes a number of charging device form factors, including a box into which multiple items can be dropped to charge. Apple settled on the Qi wireless charging specification for its mobile device, from its smartphones to the Apple Watch and its wirelessly chargeable AirPod ear buds. It remains unclear what it may do with PowerByProxi's intellectual property.